A Software Programmer is involved in creating and modifying computer programs and converting the project specifications into codes. 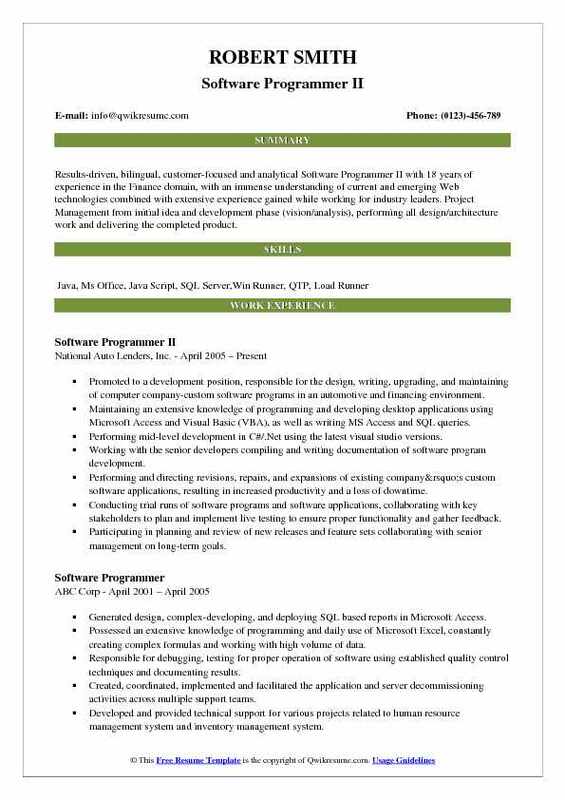 The most common roles and responsibilities that are significantly highlighted in the Software Programmer Resume include – producing software designs, formulating program specifications and other basic prototypes, transforming software designs into high functionality codes using appropriate languages, integrating individual software into high-level systems using web-based tools for creating advances SAAS as and when needed, testing codes, ensuring desirable results, performing debugging and upgrades and creating documentation for user support. 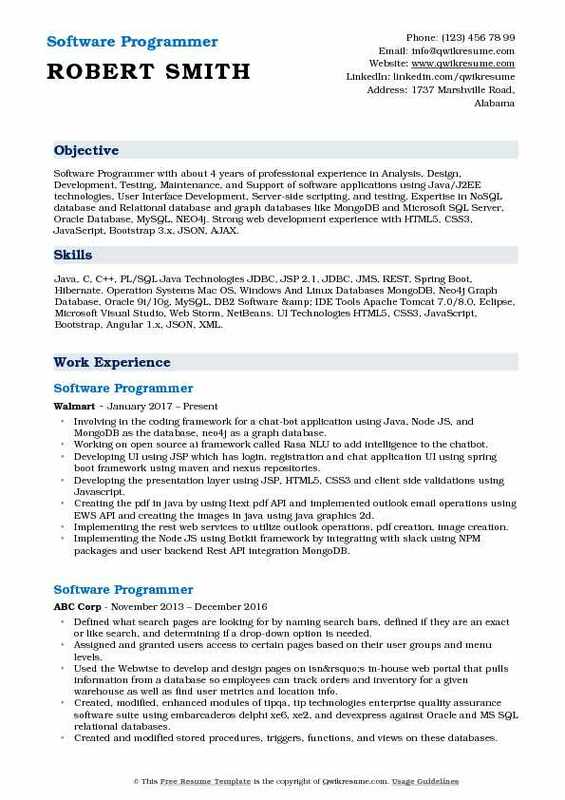 Ideal candidates seeking to make a career in this line should be able to demonstrate skills such as software programming expertise, abilities to program in various languages, experience in developing web applications, good knowledge of SQL, ORM and relational databases and an analytical mindset. Successful candidates hold a degree in the field of IT, computer science or software engineering. However, ample work experience can replace formal education. Extensively involved in analyzing business requirements and discussion with business users. Involving in the enhancement of existing system based on the business requirements, database design and system analysis. Developed ASP.Net pages using C# and server controls. Interacting with the offshore team, ensuring the task distribution and delivery on time. Involving in documenting bugs reports and build fixes. Extensively developed users controls, which are basic building blocks of pages that were, begin generated dynamically. Developing GUI using the .Net framework 3.5/ 4.0. And responsible for creating components using C#.Net. Creating the tables, views, stored procedures and functions to manipulate data. Extensively using the grids, data list and repeater controls. Developing user control and used validations controls available in the .Net environment. Creating and consuming WCF web services to expose the application functionality for different applications running the company & outside, implementing a service oriented architecture (SOA). 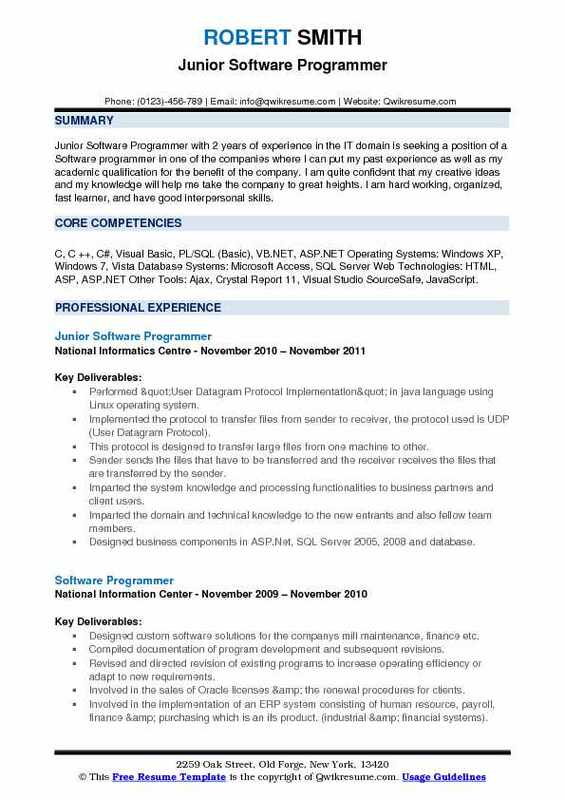 Objective : Junior Software Programmer with 2 years of experience in the IT domain is seeking a position of a Software programmer in one of the companies where I can put my past experience as well as my academic qualification for the benefit of the company. I am quite confident that my creative ideas and my knowledge will help me take the company to great heights. I am hard working, organized, fast learner, and have good interpersonal skills. Performed "User Datagram Protocol Implementation" in java language using Linux operating system. Implemented the protocol to transfer files from sender to receiver, the protocol used is UDP (User Datagram Protocol). This protocol is designed to transfer large files from one machine to other. Sender sends the files that have to be transferred and the receiver receives the files that are transferred by the sender. Imparted the system knowledge and processing functionalities to business partners and client users. Imparted the domain and technical knowledge to the new entrants and also fellow team members. Designed business components in ASP.Net, SQL Server 2005, 2008 and database. Revised and directed revision of existing programs to increase operating efficiency or adapt to new requirements. Assigned and distributed the duties to interns or contractors and overlook their work or projects. 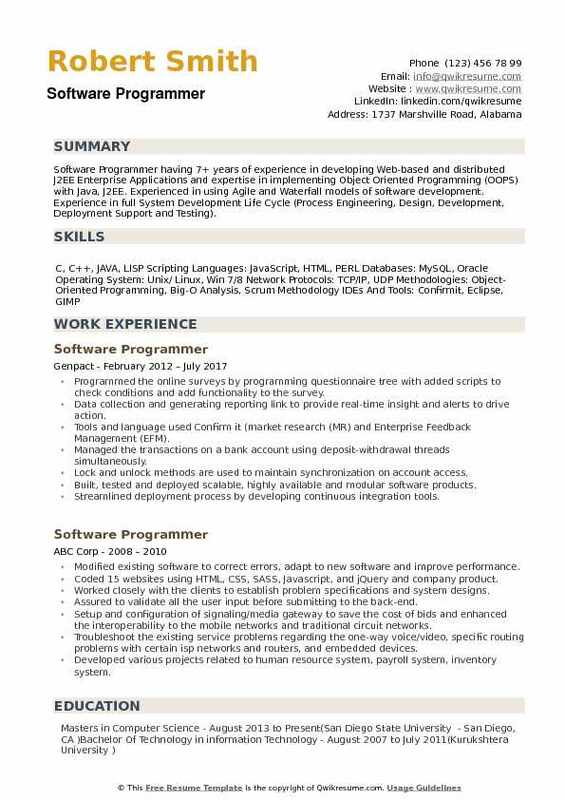 Summary : Results-driven, bilingual, customer-focused and analytical Software Programmer II with 18 years of experience in the Finance domain, with an immense understanding of current and emerging Web technologies combined with extensive experience gained while working for industry leaders. Project Management from initial idea and development phase (vision/analysis), performing all design/architecture work and delivering the completed product. 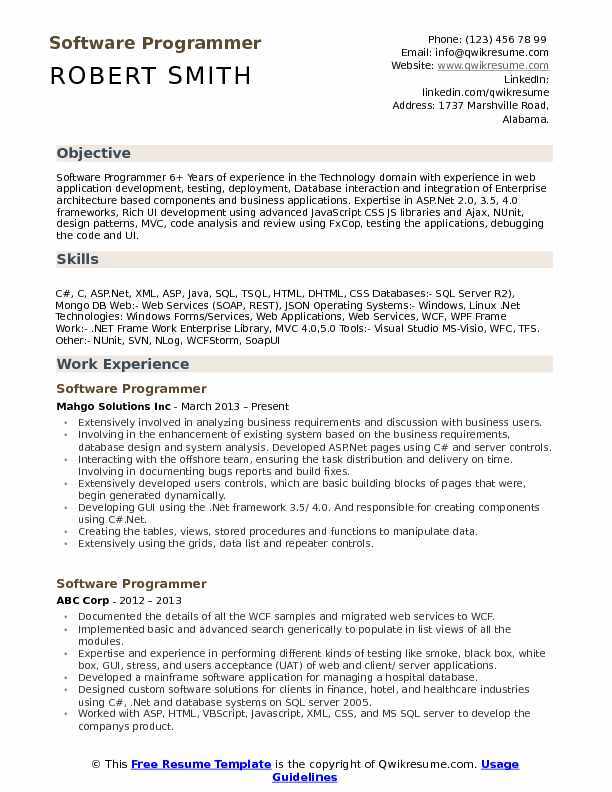 Promoted to a development position, responsible for the design, writing, upgrading, and maintaining of computer company-custom software programs in an automotive and financing environment. Maintaining an extensive knowledge of programming and developing desktop applications using Microsoft Access and Visual Basic (VBA), as well as writing MS Access and SQL queries. Performing mid-level development in C#/.Net using the latest visual studio versions. Working with the senior developers compiling and writing documentation of software program development. Performing and directing revisions, repairs, and expansions of existing company’s custom software applications, resulting in increased productivity and a loss of downtime. Conducting trial runs of software programs and software applications, collaborating with key stakeholders to plan and implement live testing to ensure proper functionality and gather feedback. Participating in planning and review of new releases and feature sets collaborating with senior management on long-term goals. Maintaining and monitoring the company’s SQL database and desktop applications as well as responsible for relational database design and development, checking all work for accuracy and ensuring all work is processed efficiently. 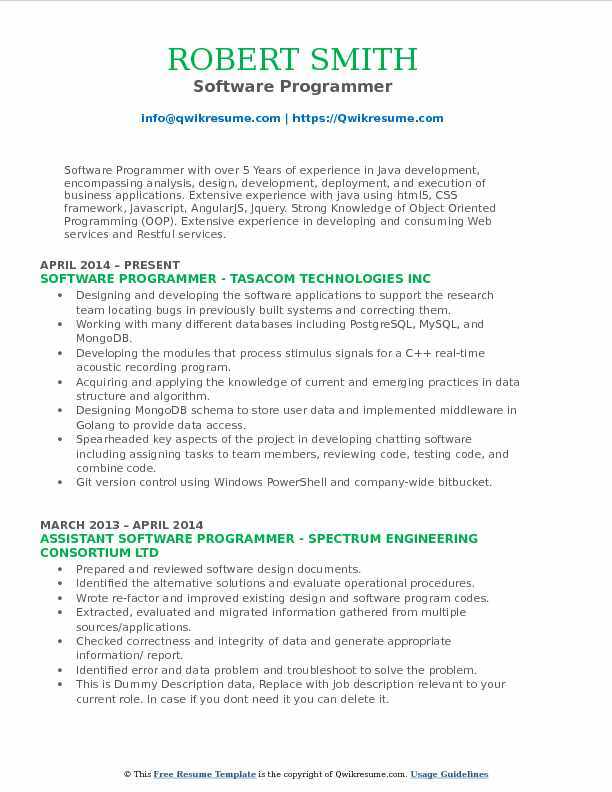 Summary : Software Programmer I with around 12+ years of experience in the Information Technology Industry. Well versed in Health Care, Banking, Mobile, Storage, Managed File Transfer and Automobile domain. Core technical strengths in C, C++, VC++, MFC, COM, DCOM, STL, Boost Library, OOAD, UML, Data Structures, Design Patterns, Multi-Threading, MOM, Perl, Shell Scripting in high productive development environment in both Linux/Unix, Windows and Mac environment. Played as an individual contributor role which is responsible for design, development, writing unit testing framework and evaluation of third-party best fit tools. Understood the existing research oba document and was completely responsible for identifying the objects using OOAD concepts. Completely responsible for the development of oba server/client socket application using C++ with the help of TCP/IP protocol suite. Developed multithreaded oba server application which receives input from the driver dashboard with the help of Unix POSIX threads and the boost worker thread libraries. Used boost mutex class and condition variables to implement the synchronization techniques in the server side oba. Developed named pipes for IPC between the application/modules on the same machine. Set up new warehouses within the entire wms system. (databases, waving application, sales application, print servers). 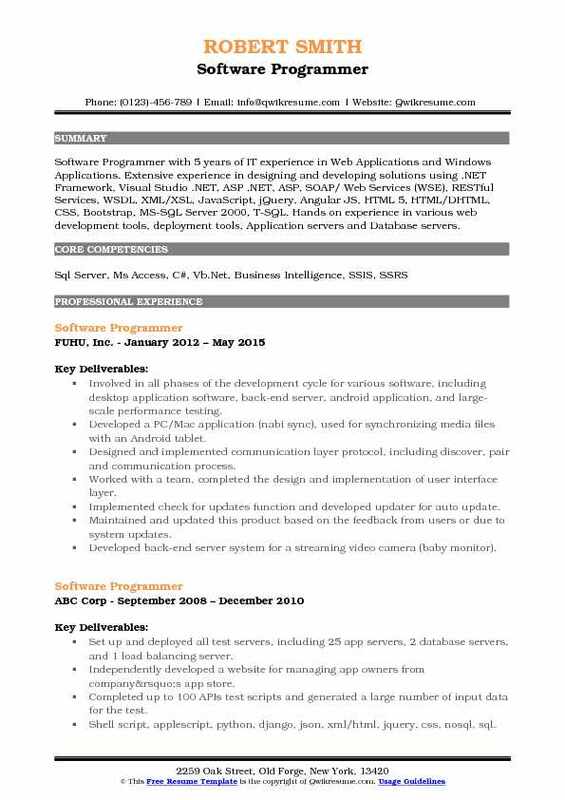 Summary : Senior Software Programmer with over 7 years of experience in Information technology and possess extensive experience in designing, developing and deploying n-tier web applications and client/server applications using Objective C, CocoaTouch, iPhone SDK, Java, web and mobile technologies for enterprise applications. Hands-on good experience with Objective-C, CocoaTouch, and iPhone SDK. Developed and executed user interface Xcode, interface builder and iPhone simulator. Developed the app using cocoa-touch frameworks such as UI Kit framework, foundation, and core graphics, server-side components like web services to data sync at client side to update on the server side. Involving in significant customer interaction resulting in stronger customer relationships. Writing the common utilities like logging, file utilities, and foundation framework. Environment: iphone sdk, xcode, sqlite3, sqlite manager, objective-c, cocoa and instruments. Played a major role in designing & developing JSP pages and XML reports. Creating SQL queries and PL/SQL procedures in Oracle to maintain and update the database. Implementing J2EE design patterns such as MVC, singleton, factory and value/data transfer etc. Involving in the coding framework for a chat-bot application using Java, Node JS, and MongoDB as the database, neo4j as a graph database. Working on open source ai framework called Rasa NLU to add intelligence to the chatbot. Developing UI using JSP which has login, registration and chat application UI using spring boot framework using maven and nexus repositories. Creating the pdf in java by using Itext pdf API and implemented outlook email operations using EWS API and creating the images in java using java graphics 2d. Implementing the rest web services to utilize outlook operations, pdf creation, image creation. Implementing the Node JS using Botkit framework by integrating with slack using NPM packages and user backend Rest API integration MongoDB. Used neo4j graph database for data visualization to understand the connectivity between the elements in data model. Used cypher query language for querying data in form of graph and presented that graph to the user in slack channel using d3. Js libraries. Designing and developing the software applications to support the research team locating bugs in previously built systems and correcting them. Working with many different databases including PostgreSQL, MySQL, and MongoDB. Developing the modules that process stimulus signals for a C++ real-time acoustic recording program. Acquiring and applying the knowledge of current and emerging practices in data structure and algorithm. Designing MongoDB schema to store user data and implemented middleware in Golang to provide data access. Spearheaded key aspects of the project in developing chatting software including assigning tasks to team members, reviewing code, testing code, and combine code. Git version control using Windows PowerShell and company-wide bitbucket. Involved in all phases of the development cycle for various software, including desktop application software, back-end server, android application, and large-scale performance testing. Developed a PC/Mac application (nabi sync), used for synchronizing media files with an Android tablet. Designed and implemented communication layer protocol, including discover, pair and communication process. Worked with a team, completed the design and implementation of user interface layer. Implemented check for updates function and developed updater for auto update. Maintained and updated this product based on the feedback from users or due to system updates. Developed back-end server system for a streaming video camera (baby monitor). Implemented several APIs, modified and verified other main apis. 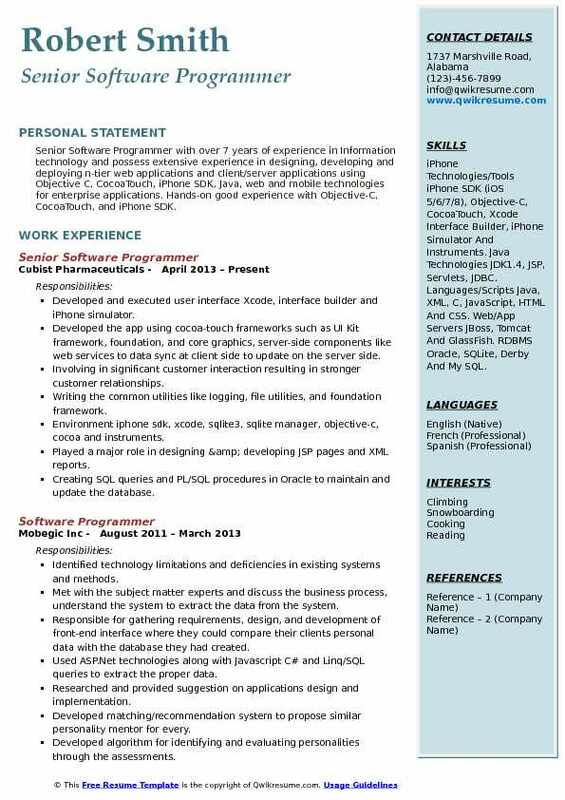 Summary : Software Programmer with over 12 Years of experience in iPhone/iPad application development. End-to-end software development lifecycle. Software development methodologies waterfall, agile. Awareness of leading-edge tools, techniques, and services within IT. Ability to work with an existing body of code (maintenance, feature additions, etc). Ability to work on multiple small projects at same time. An understanding of UI issues and challenges. Collaborated with product management to design, build and test systems. Maintained existing applications and designed and delivered new applications. Reviewed and approved all engineering, product and project scope documents prior to delivery. Built and maintained the enterprise level web-based systems and applications. Implemented the custom solutions to create actionable reporting tools for real-time data. Reduced enterprise costs by implementing automated systems for data input and management. Worked with client to understand the business need and provide a solution. Understood the user interface requirements, developing use-cases, user-friendly and eye-catching web pages. 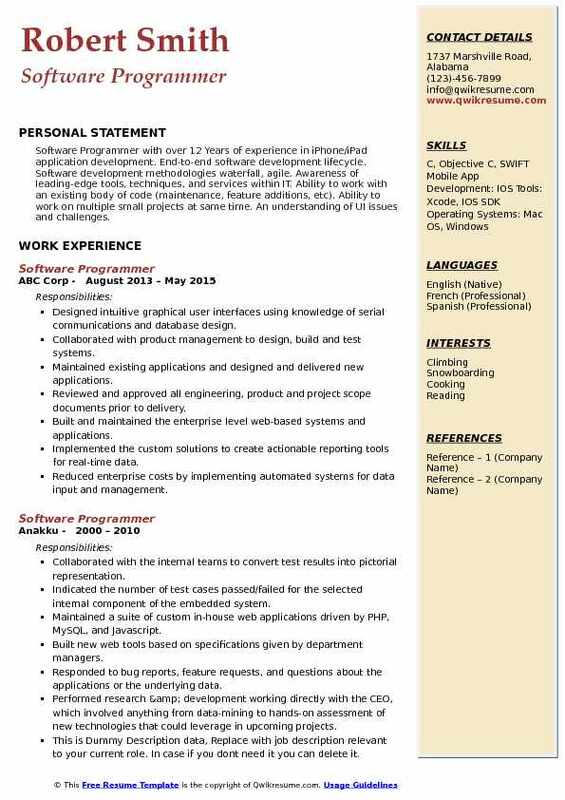 Summary : Software Programmer having 7+ years of experience in developing Web-based and distributed J2EE Enterprise Applications and expertise in implementing Object Oriented Programming (OOPS) with Java, J2EE. 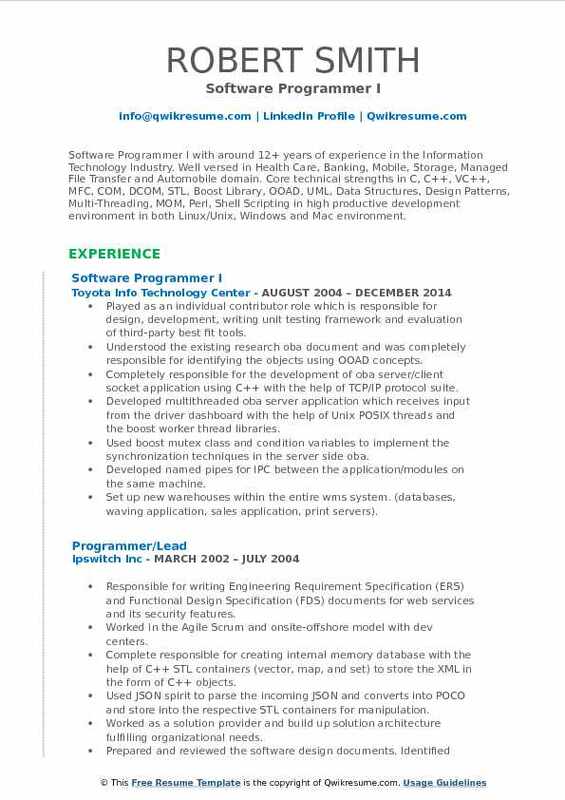 Experienced in using Agile and Waterfall models of software development. Experience in full System Development Life Cycle (Process Engineering, Design, Development, Deployment Support and Testing). Programmed the online surveys by programming questionnaire tree with added scripts to check conditions and add functionality to the survey. Data collection and generating reporting link to provide real-time insight and alerts to drive action. Tools and language used: Confirm it (market research (MR) and Enterprise Feedback Management (EFM). Managed the transactions on a bank account using deposit-withdrawal threads simultaneously. Lock and unlock methods are used to maintain synchronization on account access.